A good bread knife is an essential tool in any kitchen. It can turn slicing breads with thick crusts into a simple task. The long serrated blades glide through everything from fresh breads out of the oven to hard crusted artisanal baked goods. The best bread knives will accomplish this task without having the dough stick to the blade, and they won’t require any extra effort on your part. If you aren’t sure where to begin your search for this ideal tool, use the following information to help you find the best bread knife for your dinner table. 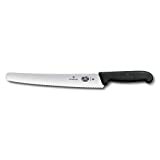 The Victorinox Swiss Army 10.25 Inch Fibrox Pro Curved Bread Knife is an excellent kitchen tool that comes with a Fibrox handle in the color black. This sturdy and compact knife is manufactured in Switzerland by the Victorinox Company. They are best known for the creation of the original Swiss army knife, but today they offer over 300 blades which have made them a favorite among professionals worldwide. 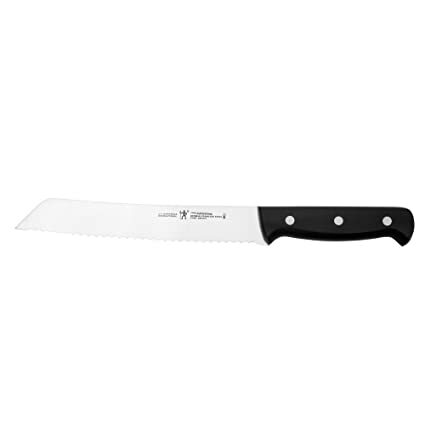 This 10 ¼ inch bread knife includes professional quality construction and materials. It can easily handle the crusty exterior of bread without crushing the soft interior. The high carbon stainless steel blade is ice tempered in order to provide you with ideal edge retention and maximum sharpness. The cold rolled steel is stamped during construction which creates a bolsterless edge. You will be able to take advantage of the entire blade while cutting and slicing, and you will find this design is much easier to sharpen. The Victorinox also has a conical ground that offers you a wider breaking point. Victorinox’s patented Fibrox handle is textured so that it is slip resistant. It also features an ergonomically designed grip that provides both comfort and balance. This bread knife is NSF approved, and it comes with a lifetime warranty against any manufacturer defects. Victorinox recommends that you hand wash this item. The total weight is 7.2 ounces, and it measures 17.2 by 3.8 by 0.6 inches. 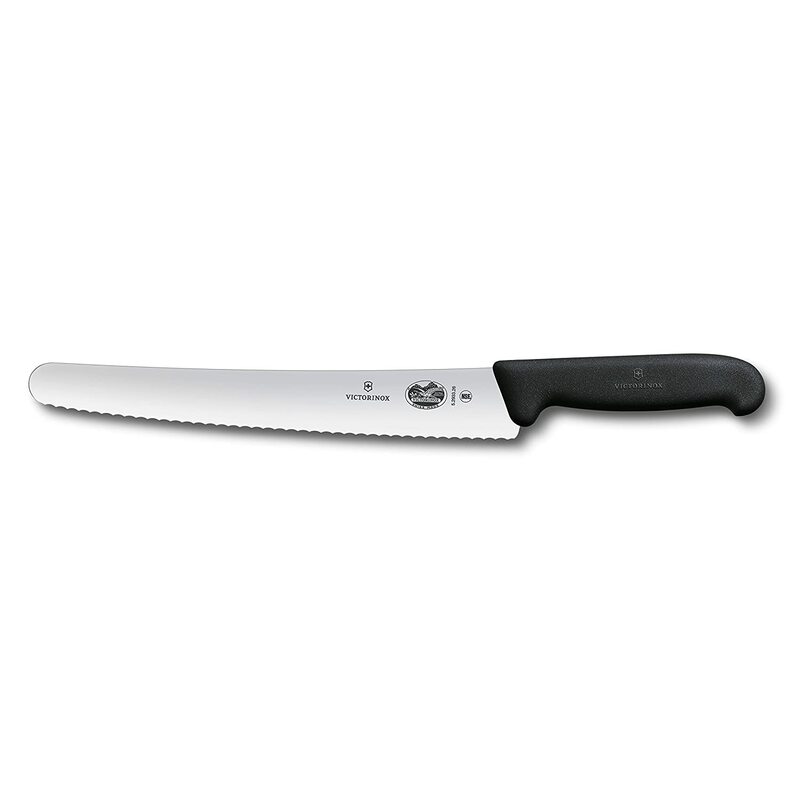 The Victorinox Bread Knife can be used equally well by left and right handed chefs and home cooks. The blade is incredibly sharp. Those who own this particular blade recommend purchasing a sheath to avoid accidentally cutting yourself. It slices into bread perfectly as well as other foods such as pork, tomatoes, and soft cheeses. It can easily become a versatile piece in any kitchen. A blade that is too thick is a common complaint among people who use bread knives. The blade on this particular knife is quite thin. It measures 1/32 of an inch at the handle, and it tapers to half of that thickness as you go towards the tip. The blade is just over ten inches long which is ideal for thick loaves of bread, but one should be aware that it doesn’t always fit in a knife block or kitchen drawer easily. The blade of the Victorinox is described by the manufacturer as wavy due to the serrated edge. This bread knife features a soft and wavy serration rather than a spiky, sharp serrated edge. The wavy design allows it to slice through breads without crushing them, and it also allows this knife to work just as beautifully on cakes. Online reviews are quite favorable for the Victorinox. Owners describe it as their favorite “go to” knife. They have found that it does much more than simply slice bread. Many state that it is the perfect sandwich maker as they can slice the bread and meat as well as cut up vegetables with just one utensil. The edge remains extremely sharp, and the Fibrox handle offers a solid grip for the user. The curved edge makes it easy to cut through the tough bottom crust at the center of a loaf while reducing tearing. The price point and versatility of this kitchen tool makes it an excellent value for any home chef or professional kitchen. The Chicago Cutlery Walnut Tradition Bread/Slicing Knife includes a ten inch serrated blade. It slices neatly into breads with thicker crusts as well as many other types of food. The stainless steel, high carbon 420 blade resists stains and rust, and it has a Taper Grind edge that is exclusive to Chicago Cutlery. This edge will remain sharp longer, and if it does need sharpening, it is easier to do than on similar knives. This bread knife features a full tang blade that extends the entire length of the tool from its tip to the end of the handle. This design lends to the overall weight and balance of the knife. The solid walnut handle has an ergonomic, contoured shape that provides you with a firm grip. The handle and blade is secured with triple compression brass rivets for a sturdy knife you can depend on as well as a classic style that looks great in the kitchen. The Chicago Cutlery Walnut Tradition Bread Knife will measure 16 by 1 by 0.7 inches, and it weighs 4.8 ounces. The manufacturer recommends hand washing due to the wood handle, and a lifetime warranty is included in your purchase price. This particular knife does not come with a sheath, but the plastic holder it comes in can be reused for storing the piece. It is manufactured in China. 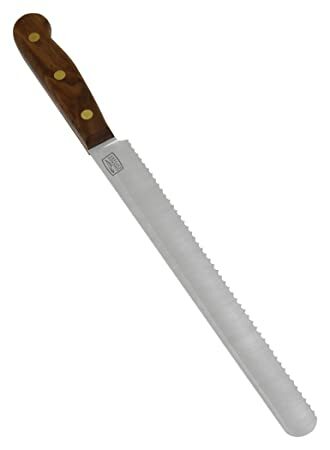 Online reviews describe this Chicago Cutlery Bread Knife as an outstanding value. It has a much lower price point than similar knives on the market. The serrations are only on one side of the blade. This may make it more difficult for left handed chefs and home cooks, but it still gets a very high rating among those who own it. The blade is a full ten inches long and the handle adds another five inches to the length. It can be difficult to fit into a knife block or a kitchen drawer easily. Those who own this particular bread knife state that it glides through bread nicely. It even works on harder crusts like you would find on artisanal breads and ciabatta. Many have found that it performs well above the expectations of knives that sell for triple the cost. The blade is thick and strong so that it won’t bend while slicing. The high quality construction allows you to easily achieve thin and uniform slices although most owners state that it is strictly a bread knife. It does not work very well on vegetables or meat other than tomatoes. It will give you thinly sliced tomatoes without having to saw through the food. The International Fine Edge Pro 8-Inch Bread Knife by J. 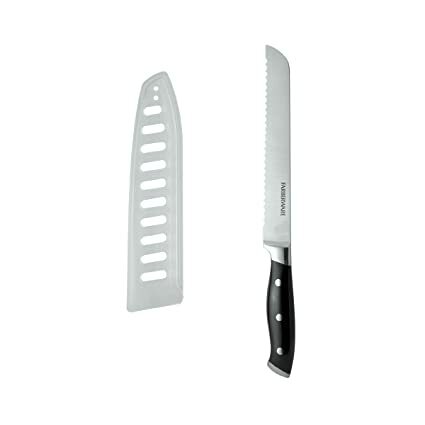 A. Henckels is a versatile kitchen tool that has a smaller size than many similar knifes. This is a beneficial feature when it comes to storing the piece as well as maneuvering it while slicing. The serrated blade will glide through hard crusted breads just as easily as it slices into tomatoes. The high carbon, stainless steel German stamped blade allows you to create thin and uniform slices with ease. The full tang blade is triple riveted for safety and sturdiness. The fully visible tang also provides you with the correct balance. The handle is created out of a polypropylene material, and it has a black satin finish that makes this knife an attractive addition to any home or professional kitchen. It is dishwasher safe, and it includes a lifetime limited warranty from the manufacturer. The blade’s serrations are larger than on similar bread knifes. This is described as a scalloped edge which allows the knife to yield easily to crusty loafs. The entire knife will measure 12.8 by 1.5 by 0.8 inches, and it weighs 7.2 ounces. 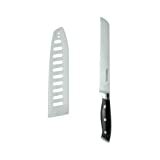 It is manufactured by Zwilling J. A. Henckels Cutlery in China. It does not come with any sheathing, but the compact size allows it to fit nicely into most butcher blocks as well as kitchen drawers. Online reviews state that the Henckel International Fine Edge Pro is a great knife at a great price. Those who make homemade bread describe how it easily glides through fresh bread that is still warm. Many knives will simply mash the loaf and end up with the dough stuck to the blade. This particular bread knife will cut it into even, thin slices without any trouble. It also works well on crustier baked goods such as bagels. Many worried that they would be getting an inferior piece of equipment for such a low price point, but were pleasantly surprised by the knife’s quality. It has a sturdy design, stays sharp, and resists rust and staining. The strong handles are well weighted which makes cutting with it even better. It is an excellent starter knife for any home cook that wants to begin a collection of useful cutting and slicing devices. Experienced chefs state that it is a wonderful addition to their existing cutlery as well. It is common for owners of the Henckel International Bread Knife to buy additional ones to give as gifts. The Pro Forged Bread Knife from Farberware is perfect for cutting round and long bread loaves. The stainless steel, stamped blade is held safely and securely in place with a triple riveted design, and the ergonomic grip on the handle gives you complete control while slicing. A plastic sheath for the blade is included in your purchase price. This helps protect the knife’s edge while providing you with additional safety. Each Farberware Pro Forged Bread Knife is weighted perfectly for the best balance and control. Hand washing with warm water and a mild detergent is recommended to keep your knife in top condition. Rinse and dry it immediately for best results. The high carbon stainless steel blade retains an ultra-sharp edge for a longer period of time then many of the conventional blades found on similar bread knives that are available for this price. This knife will measure 1.8 by 0.8 by 13 inches, and it weighs 0.3 ounces. It is manufactured for Farberware by Lifetime Brands in China. The plastic sheath that comes with the knife is sturdy and holds up well when transporting this tool from one place to another. It fits snugly so that you don’t have to worry about it coming off. It is a highly appreciated feature when you consider just how sharp the blade of this particular knife is. Online reviews describe this bread knife from Farberware as a terrific kitchen tool for the price. Many people use it for other tasks than simply slicing bread, but those who have owned one for quite some time recommend buying separate knives for more advanced cutting and dicing. Those who hand wash and take special care of the knife stated that it kept a sharp edge for a long time without rusting or staining. The low price point makes this knife ideal for anyone that is just starting out. Hold each bread knife in your hand before deciding which one to purchase. The handle should rest comfortably in your hand. You may not think it fits well in your hand even though someone else might describe the knife as comfortable with a good grip. Every home cook and chef has their own unique feel when using a bread knife. Consider where the steel is located in the bread knife as well as how much is in it. Watch for signs of welding or joining, especially in the knife’s hilt. These are weak points in a knife. Always avoid a knife with weak points that are more likely to break or bend. The top rated knives are created with one single piece of steel, and they are often hand forged. Cheaply made knives are usually thin, have handles that are thickly covered in plastic, and have insubstantial hilts. Consider the weight of your bread knife. Lightweight knives are excellent for speed and precision while heavy knives can require more work to use. A good bread knife should have a balanced weight that feels sturdy without being heavy. Knives used for chopping are usually lightweight, and those used for cutting solid foods such as nuts, palm sugar, and fresh ginger are heavy. Inspect the balance of a bread knife. Quality ones will have a nice balance without excessive weight in the handle or blade. Simply place your finger at the blade end of the handle. Hold it horizontally with the cutting edge down. If it is well balanced, it won’t fall off of your finger. Balance in a knife makes cutting easier with less effort from the user. It also relieves the strain that can be put on your arm while slicing. Closely inspect the hilt of a knife before buying it. This area should be well joined and easy to clean. In most situations the hilt is the most solid part of the device. This is where the strain caused by pressing down on the handle will travel through to the blade. Any hilt that is thin, covered in plastic, or has a join or weld visible should cause you concern. You also want to avoid any gaps in the hilt area where food can get trapped and breed bacteria. Take into consideration what type of material the handle is made of. Most manufacturers will use plastic, wood, or toughened resin to create the handle. Avoid old fashioned knives that have bone handles. Bone and low density or soft wood can crumble over time and cause injury to the user. Always follow the manufacturer’s directions for cleaning to keep your knife in top condition. If you are looking for the ultimate bread knife that can slice through the toughest crusted breads, the Victorinox Bread Knife will be perfect. It can also handle slicing vegetables such as tomatoes with ease, and it has an elegant design that features the patented Fibrox handle. The Chicago Cutlery Walnut Traditions 10-Inch Serrated Bread Knife will also do a wonderful job of slicing a variety of baked goods along with several other foods. The stunning wood handle makes this knife an attractive choice that is sturdy and well-constructed at an affordable price point. 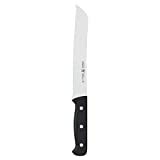 Those who simply want a reliable bread knife that won’t mash their loaves will love the Fine Edge Pro 8-Inch Bread Knife from Henckels International. The smaller blade size makes it quite appealing to anyone that is just starting out. It is easy to handle and creates thin, uniform slices. These are all excellent options when it comes to slicing bread, but the Farberware Pro Forged Bread Knife is an exceptional value. It’s the perfect knife to start your collection with, and the clear plastic sheath keeps both you and the cutting edge protected and safe.